Glass shower enclosures and doors typically come in two thicknesses: 3/8” or 1/2”. We most commonly recommend 3/8” thick glass for residential showers. Shower glass styles come in a wide variety - we can show you samples of many shower door glass styles, ensuring there’s one to meet your project needs. 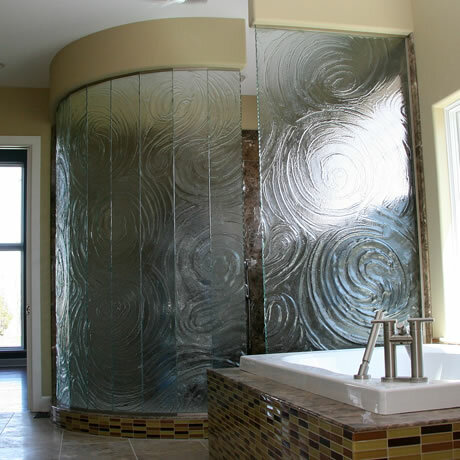 We also have a selection of decorative cast art glass for more custom shower enclosures. Contact us to view a complete selection of shower door glass options or stop in at our location in Rochester or Syracuse. View our Shower Glass Door Gallery to see recent installations. A selection of some of our available shower glass. We also have a many different styles and finishes of shower door and enclosure hardware and handles giving you the ability to truly customize the look of your new glass shower. Contact us for more information. 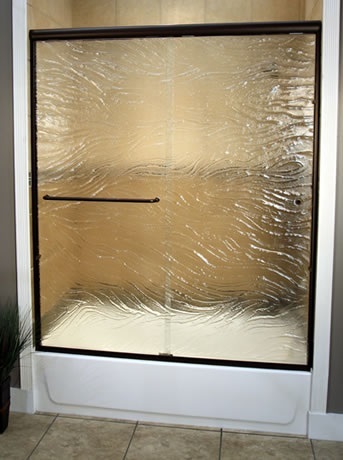 Flower City Glass offers Cardinal Glass’ ultra- premium cast art glass shower enclosures. There are twelve hand-crafted glass patterns to choose from using 3/8” thick glass ( ¼” and ½’” glass may be available, please ask). All cast art glass shower enclosures are fabricated to accommodate Cardinal’s heavy glass hardware. Flower City Glass also offers ShowerGuard glass. ShowerGuard is coated wiht a patented technology that protects against hard water, heat, humidity, soap and some cleaning agents that can spot, discolor and corrode the surface of shower glass, making it hard to clean and dull.The ShowerGuard technology for shower glass doors and enclosures provides permanent, proven protection that stays beautiful for a lifetime – guaranteed. ShowerGuard never breaks down and never needs to be reapplied, and makes it easy to keep your shower glass clean for the life of your shower. Ask for ShowerGuard Glass when you order your shower glass. And now you can get a $25 rebate when you buy ShowerGuard protection for your shower glass, click here for details. You can find helpful information on common cleaning product recommended for your ShowerGuard glass here.